Nevertheless, it had been a productive day. 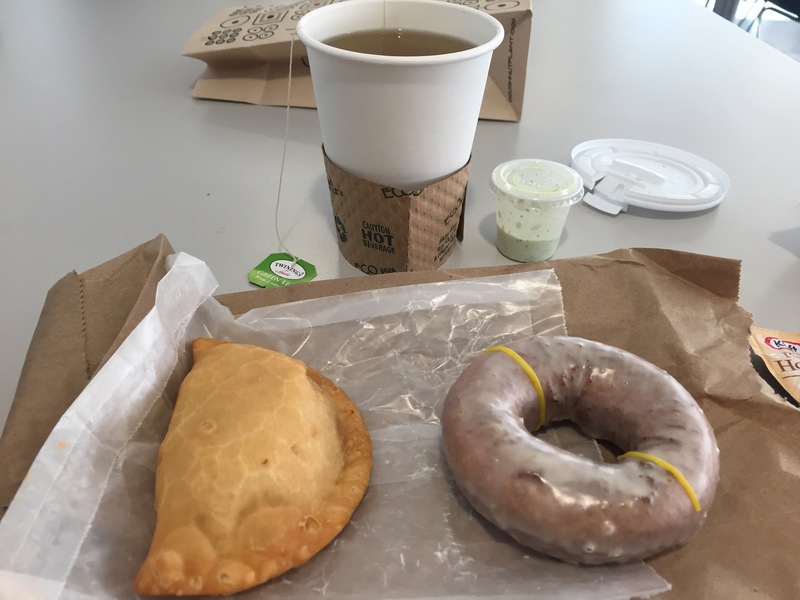 Today at Falchi’s, I tried something familiar (chicken empanada at Karu Cafe) and unfamiliar (Yuzu cake doughnut at Doughnut Plant) to my palate. As I stated before, the empanadas at Karu are awesome. The spice mix of the chicken reminds me of making tacos for dinner at home growing up, and the shredded white meat, dotted with pimentos and cilantro, and crushed-up hard-boiled egg were plentiful inside the pocket. Verde sauce was a wonderful accompaniment to the dish. Along with green hot tea with honey, the total cost was $6. The Doughnut Plant is now honoring their Tokyo branch, which is celebrating its 12th anniversary. Huzzah! The new flavors looked good; after omitting the Green Macha doughnut today, since I had already possessed some green tea ;), there was Black Seasame and Yuzu left. “What is Yuzu?” I asked the friendly, young cashier. “A fruit that tastes like a hybrid of passion fruit and lemon,” she eagerly answered. Hummmm, next time then. In the meantime, the yuzu was tart and fruity, like lemon/orange citrus. So delicious.